"In August I started thinking about what to get my boyfriend for Christmas. I had this BIG GREAT idea. 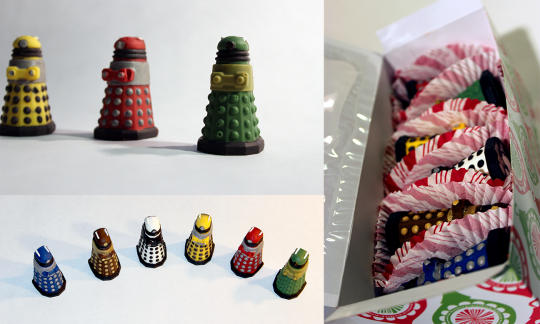 I would make hand painted Tardises and Daleks chocolate candies and fill them with Doctor Who themed fillings and flavors. So, I've spent 4 months (very poorly) learning how to make chocolate candies. I've discovered that I am too poor to buy expensive chocolate or proper candy melts, I am -terrible- at tempering chocolate, I can not get the tardis out of the mold, and candy melts need to be kept warm using an electric skillet (or in my case a George Foreman grill) to keep them warm enough to use. I've learned a great deal of other things on this journey, but I'll keep it short. I'm pretty proud of myself to be completely honest. They aren't perfect, but I really like how they came out. These 6 took me 15 hours collectively. These are completely edible. Made of Wilton candy melts, lustre dust, chocolate, and each a different filling. "Air From My Lungs" Hollow"